Dr. Rob Yonover is an entrepreneur from Hawaii with a solution that is guaranteed to save lives: the SeeRescue Streamer. His simple yet life-saving device helps rescue teams find you whenever you are lost in sea or inland. But with a proposal of $200,000 for 20% stake in the company, will the sharks rescue this business? Have you ever been lost? Whether it was on a hike in the forest or during a sailing trip, there’s no worse feeling than not knowing how to get back home. 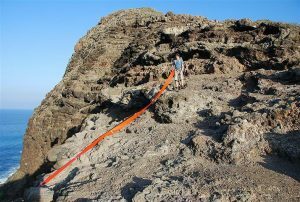 And you are not alone, as it’s estimated that there are at least 3 people lost at sea and 7 lost hikers every single day. But with no one to turn to and no way to make your presence noticed, how would you get out of this tricky situation? With SeeRescue Streamer now you can easily let rescuers know what your precise location is. The SeeRescue Streamer is a visual locating device, that turns you into a large visible target. It’s basically a very long orange fabric strip with air-filled white bars which allow the SeeRescue Streamer to spin like a helix. It also includes lights, and reflectors, help will be quickly on its way regardless of whether it’s day or night. How easy is it carry? The entire device can be packed into a small bag and weighs only 13 ounces or 8 ounces (depending on the size). As you may have noticed, there are two sizes available, the heavier one being the military version, the lighter one the fighter pilot version. As Dr. Yonover went on with his demonstration, he showed the sharks a photo of a sea-bound person with and without the SeeRescue, showing how impressive it is that such a small device could bring such a high amount of visibility. But why not go for the classical flare? The problem with smoke flares and sea dyes are that they have quite a short utility time, meaning they all eventually blow away, or dissolve in the ocean’ water. According to Dr. Yonover, the impressive device has saved 4 lives already! Dr. Yonover went on to mention that the device is patented, and military-approved. With such a great concept, how are the sales like? The SeeRescue Streamer is sold all over the world, and has made a staggering $15 million in sales! The sharks immediately questioned the low valuation taking into consideration the sales. Yonover then explained that the licensing period for the technology lasted over 15 years and although he renewed the license once the period was over. Although it was unclear why Yonover mentioned this licensing period, he then carried on to explain that the $15 million in sales were made over a period of 15 years. He also referred that he wanted to try a new sales tactic, which would be appealing to both the military and the everyday consumer and explorer. Robert then mentioned that when he went boating, he would use a small GPS device in order to be tracked in case of an emergency. Dr. Yonover then explained that, just like boats, technology also fails. The topic of sales was once again introduced, and it was clarified that last year they made $200,000 in sales, and this year $250,000. The retail cost is $78 for the smaller one and $118 for the bigger SeeRescue. Yonover’s true reason for taking a dip in the shark tank is quite simple: he doesn’t have the funding or expertise as he needed when he had the help of a licensing group, therefore turning to the sharks. The ultimate use for the money invested would be to get a contract with the military, and at the same time, make sure his product would be used as a feature in lifejackets. Daymond was the first shark to back out of this deal. Although he liked the product, Yonover’s desire to pursue a contract with the government wasn’t appealing to Daymond. Lori was the second shark to share her insight, praising the entrepreneur for the idea, but stressing how hard it is to break into the mass retail market. Believing this is not a mass consumer product, she ended up not investing on the product. Robert then focused on the retail part and the military applications of the product, saying that he did see a future within these markets. Despite all that, he did foresee some difficulties and hurdles when it came to the consumer’s side of retail, thus backing out of the deal. Mark then focused on the investment side of it and his own perspective as an investor: first off the amount of work required, second of all how big can this product be. The million dollar question (or rather the $200,000 question) was how would Mark’s expertise help the business. With no ties to the military, Mark didn’t quite understand how his involvement in SeeRescue would lead to the company getting a contract with the military. He backed out of the deal soon after. The last shark still on the fight for an investment opportunity was Kevin, who also focused on what value he could bring to the company. Due to Yonover’s desire to redesign the company, Kevin would need to focus on infrastructure, marketing, social media, and more. With the prospect of such a huge amount of work involved, Kevin also backed out of the race. 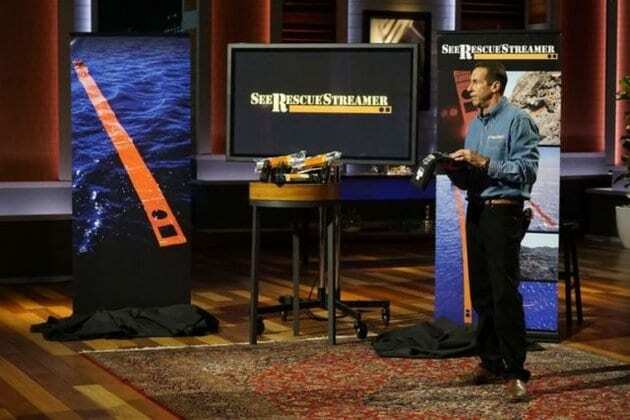 What happened to SeeRescue Streamer after Shark Tank? It’s still quite early to have any updates on the company since the episode aired, although we are quite interested and curious to know how the company has evolved. With this amount of exposure for the visibility, device is good news for the entrepreneur and his team. If you like what you have just read and would love to buy your own high-duration visibility device, make sure to visit their website seerescuestreamer.com or purchase it online here. This product uses a patented emergency signaling technology that is military grade. Unlike other survival gear, the See Rescue Streamer is the only continuous and passive signaling device that can help rescuers find you quicker. It can deploy to 6 inches wide by 25 feet and ensure that you can be rescued on land or sea both day and night, 24/7. It’s very easy to carry in your bags and luggage as it only weighs 5 ounces. Get yours today before going on an adventure as you don’t know when you might need one.